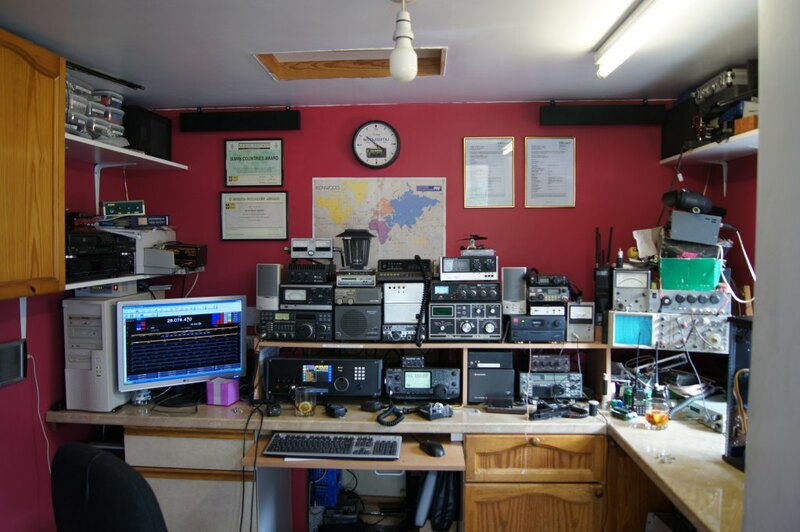 My idea was to build a false rear wall to the shack where I can run all the feeders, and fit a removable panel to access the rear of the radios without having to move everything. 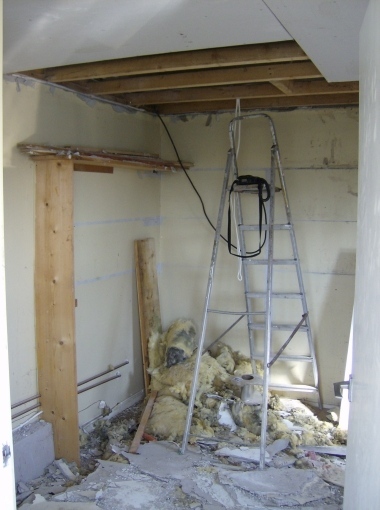 Very simply, I stood against the rear wall of the room and held a piece of wood to measure how much room I needed to squeeze into, job sorted! 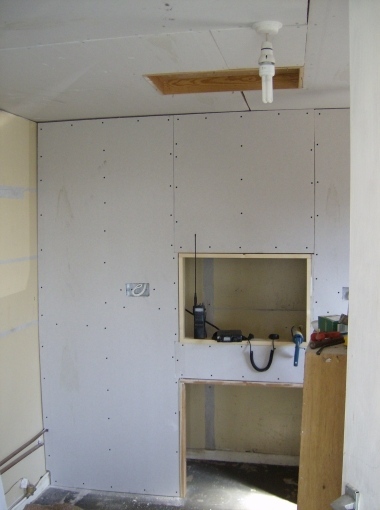 Starting to look like a shack! Although I was left with a room only 8ft by 8ft it is a huge improvement over my previous hideaway under the stairs of the previous QTH! 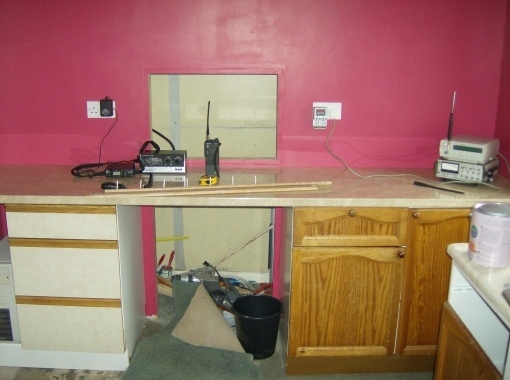 On a visit to the local DIY store, I carelessly allowed Caroline, the XYL to pick the paint colour for the walls, "Raspberry Rush" more like lipstick pink when it went on but two days later it had darkened up nicely and once you acclimatise to it, it's quite nice! It's still a construction site but we're getting nearer. The removable panels haven't yet been made and there are still tools and paintbrushes about but it's now looking like a "real" radio shack! 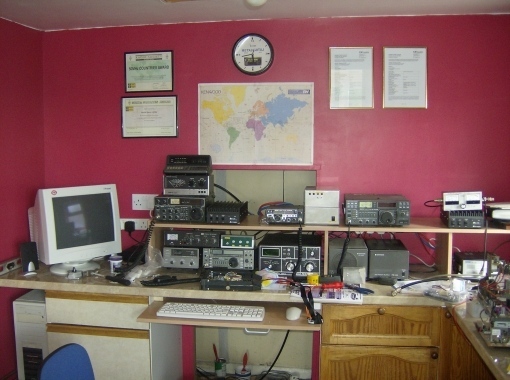 As is normal, the shack is a scene of constant change as gear is added or moved. I seem to be always adding new shelves! The picture below was taken in September 2010, things are still changing! Just as soon as I've tidied up I'll post a new picture, possibly this year hi hi! 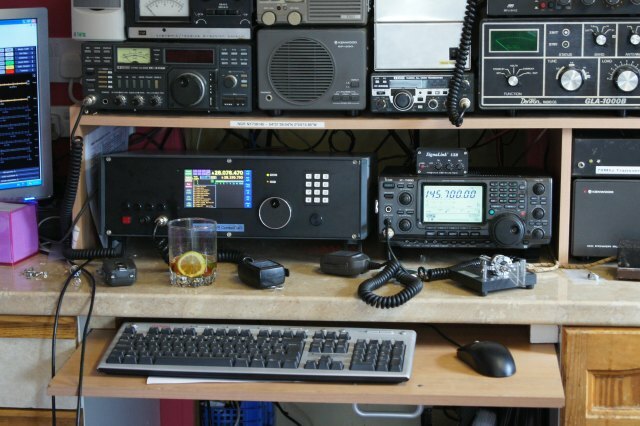 The ComboSTaR fits in quite nicely alongside my IC-7400, note the celebratory glass of Pimms next to the mic! The black things just below the ceiling are the speakers for the Combo, yes it is stereo! Homemade 150w DDS/DSP HF Transceiver. With performance you have to hear to believe, my ComboSTaR makes me smile every time I turn it on!